The election of Donald Trump to the American presidency is causing turmoil in Italian politics in the run-up to a constitutional referendum to be held on December 4. The referendum sets the stage for Italy to host the third major anti-establishment protest shock of 2016 before we’ve even had the chance fully to digest the news of Trump and Brexit. The Five Star Movement has crowed Donald Trump’s election as evidence of a protest movement sweeping the West. It is calling on Italians to seize the opportunity of the referendum to join in. And indeed, support for the reform has consistently declined throughout the year. 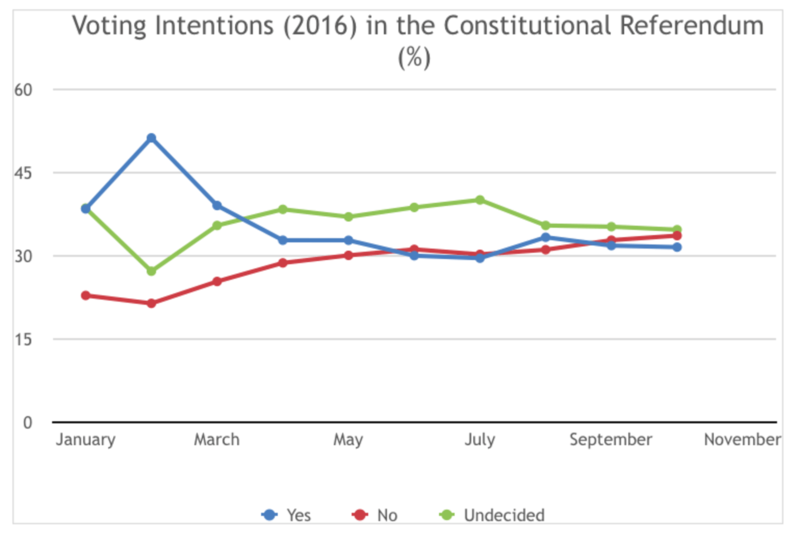 Polls now show a small majority in favor of voting No – although a large number of undecided voters leaves the outcome in the balance. Renzi, since the summer, has attempted to change tack and depersonalize the referendum, separating its outcome from his own future. But the genie can’t be put back in the bottle. Polls indicate that over half of Italians intending to vote, view the referendum as a judgment on the Renzi government and not the reform. Renzi will surely be thinking of former British prime minister David Cameron, who famously argued that he would not resign if he lost the Brexit referendum, even when most observers knew that it would be inevitable. A No vote in the referendum would signal not just the rejection of the reform but the end of the Renzi experiment. This would probably be a “technical” or “institutional” government along the lines of those led by Renzi’s two immediate predecessors, Mario Monti and Enrico Letta. These administrations were installed under the auspices of the non-partisan Italian president with a specific program of reform to implement, based on the (fragile) support of different political forces in parliament. Yet, the divisions between the parties over the sort of electoral reform needed would cause months of negotiation, instability, lack of direction and possible stalemate. For Renzi, there is bitter irony in the way this referendum has turned into an impending watershed for Italian politics. He stands to lose both the reform and possibly his political career on a wave of anti-establishment protest when his own emergence as the leader of the Democratic Party and then as Prime Minister was precisely on the basis of an anti-establishment program. He swept to power promising to scrap the old political class (rottamazione) and lay the foundations for a “new politics” in Italy. That was barely two years ago, but Renzi has learned to his cost that an anti-establishment profile does not last long once in office.